Tigers Bay man insists he will shine on September 10 at the Odyssey Arena. ‘The Jackal’ has continued with his intense preparations in England for the September 10 show despite the disappointment of Kiko Martinez pulling out of their proposed European super-bantamweight title fight. Martinez was forced to withdraw and relinquish the European crown as his father fell seriously ill and had his leg amputated last week. The North Belfast man understands why Martinez pulled-out but is nevertheless disappointed. “It’s a bit of a set-back with Kiko pulling out but he has personal reasons behind that and you have to respect that,” said Frampton from his training base. As of today (Thursday), there has been no confirmation as to who Frampton will face and what title will be on the line but speculation has been in overdrive all week. Rendall Munroe and Willie Casey were the first two names linked, but both declined as they are already committed to fight in the following weeks. Casey will appear at the Kings Hall on September 17 against Daniel Kodjo Sassou (30-17-4) and his manager, Gary Hyde, said that while ‘Big Bang’ would like the fight in the future, now is not the right time. “We aren’t taking that fight now. We will take it eventually in the next few months but not right now,” said Hyde. Despite not knowing who he will face, Frampton is expecting a quality opponent on the night and believes local fight fans will be in for a treat. Paul Hyland has been the latest name linked to appear but ‘Carlos’ he has just had to get on with things and ensure he is in top condition. He is expecting a tough challenge from whoever agrees to face him but is backing himself to perform. “We are still in the dark. There is a list of names and I still don’t know who I will be fighting, but all I do know is that I will be on the bill on September 10,” stressed the 24-year-old. “Matchroom Sports and Eddie Hearn are working very hard to get me a good fight. They want it to be a title fight and we are 100 per-cent sure they will come good on their word. “I was preparing for Kiko Martinez so it’s a set-back but I’m a professional and I have done a lot of hard rounds in sparring. “I have come across so many different styles as a professional and an amateur so whoever it is I’m sure I will be able to deal with him. “I will just keep training and stay focused because I have a fight on September 10. I don’t know who exactly but it will be a title fight over 12 rounds and it will be a good opponent. “So whoever wants to come and fight me and take it to me then I will produce the goods. While locals fans will be disappointed that the mouth-watering showdown with ‘Mini Tyson’ has fallen through, the Tigers Bay man is guaranteeing a top performance and an improvement on his last showing against Robbie Turley. 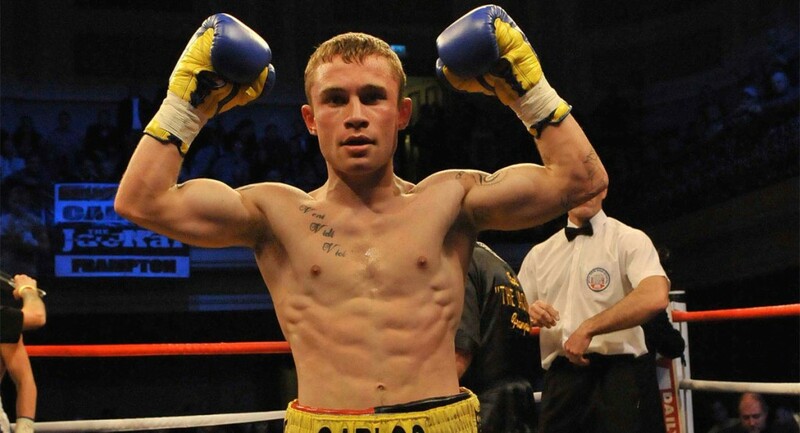 “I will not make the same mistakes as last time (against Robbie Turley),” promised Frampton. “That was my first fight live on Sky and I was maybe a bit too excited throwing wild shots looking for the knockout but I won’t make the same mistakes again. The Gerry Storey trained boxer believes golden opportunity to showcase his talents in front of a massive crowd and a live television audience who will be tuning in to watch the top of the bill fight between Paul McCloskey and Breidis Prescott. Frampton will return home to complete his final preparations next week and is not only looking forward to fight night, but also to see his young daughter who he has been away from for much of the six weeks. “I will be back home on Tuesday or Wednesday. I finish the hard graft this week and then I will just take it a bit easier heading into the fight,” revealed Carl. “Everything is perfect with the weight and I could make it tomorrow if I wanted so everything is great. “I have sold a lot of tickets for this. I know McCloskey is a massive ticket seller but a lot of people were coming to see me and Kiko.